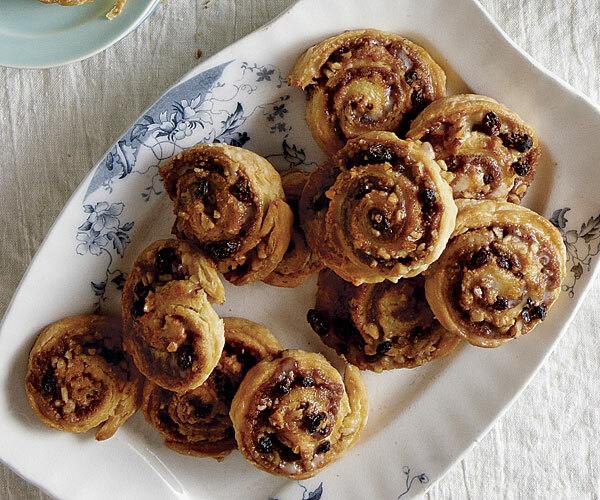 These buttery, not-too-sweet pinwheels are perfect for a weekend breakfast because they come together easily and there’s no need to wait for the dough to rise, as with traditional yeasted cinnamon rolls. In a small bowl, combine the sugar, raisins, walnuts, and cinnamon. On a floured surface, pat the dough into a 5-inch square. 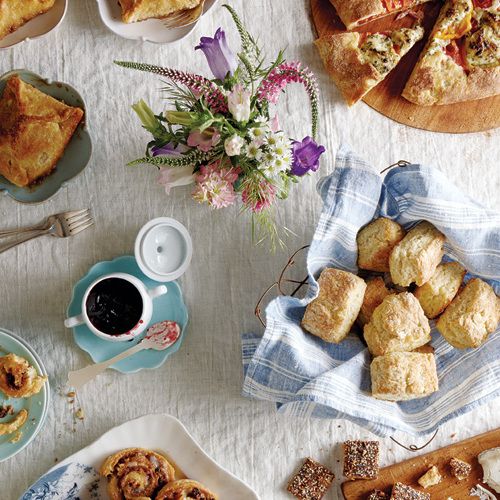 Using a floured rolling pin, roll the dough into a 12-inch square. Brush the dough with 2 Tbs. of the butter and evenly sprinkle with the sugar mixture. Tightly roll up the dough (like a jelly roll), pinching the seam to seal it shut. Using a serrated knife, cut the roll crosswise into 12 pieces. Arrange the pieces cut side down on the prepared sheet, spacing them about 1 inch apart. Bake until puffed and golden-brown, 15 to 18 minutes. Transfer to a wire rack and brush with the remaining 2 Tbs. melted butter. Let cool until warm, about 10 minutes, before serving. Sliced, unbaked pinwheels can be wrapped on the sheet in plastic and frozen for up to 1 month. Thaw in the refrigerator overnight before baking. Quick - Easy - Yummy - Simple.I had the same problem as another reviewer: difficult to handle although the dough came out of the fridge. Definitively chill again between the square faze and the rolling up faze and then again before slicing. Was very tasty and "fluffy". I put all of the sugar and it was not too sweet!!! Could get 12 cuts out of it. Will certainly make this again. We weren't in love with these. I think we were expecting a little more heft and moisture. They were okay, but not great.